← Day 81: Visit Norfolk County. Maybe it’s a small town thing, but growing up, we were never allowed to even dream about setting off fireworks by ourselves. This was strictly an activity to be carried out by licensed and knowledgeable pyro-technicians, funded by the city, executed on national holidays, and observed from a safe distance, preferably from inside our family car. Looking back, this may have been to allow my parents sufficient time to make a speedy getaway in case a mischievous neighbour did decide to set them off nearby and gave us any more crazy ideas (apparently, we came up with enough of those on our own). Thus, it came as a huge surprise when a colleague of mine that I was celebrating new year’s eve with one year in Germany invited me to join him and his family to set off fireworks in their local park after dinner. I honestly thought that this was illegal, and that my host was just trying to get a reaction out of me. Or, more likely, that he had a secret double-life and was a certifiable pyromaniac by night. Regardless, I was fascinated and a little giddy with the slight element of danger involved, as I watched the process from a reasonably safe distance. The sparklers were thrown in for free! So, today’s mixed results should not really come as much of a surprise. As many of my new things do, it all began with a deal. Yep, it was just another miser, albeit holiday, Monday. 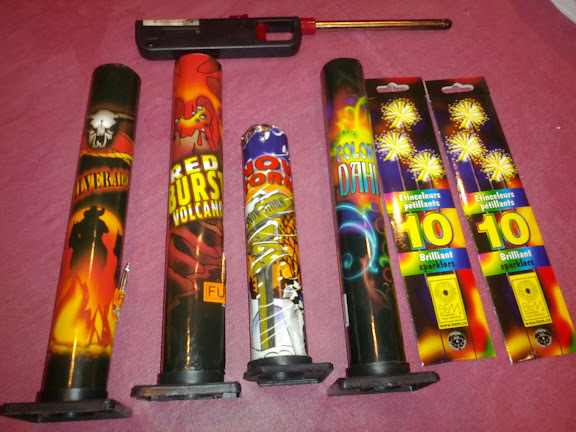 I had purchased a handful of fireworks last week with a voucher (I paid $9 for $20 worth) that was supposed to be used towards a particular selection of combustibles that were unfortunately backordered, so the manager substituted gawd only knows what, which were purportedly worth more than the original deal, and wished me luck. I managed to get them home without any explosions, and considered that to be a good omen. This evening, I met up with some family and friends for a little wine and cheese to watch the officially sanctioned fireworks over Ashbridges Bay. Mr. Champers insisted on coming along as well, just in case we were able to catch a glimpse of Chuck and Camilla, who were also in the ‘hood for the occasion. The ever-so-uncarefully crafted plan was to try and light the fireworks prior to the main event, so that we could then relax and enjoy the show. The only caveat? I forgot to bring along anything to light them with! Yep, those pesky details struck again… Now, I am usually quite thankful that very few people smoke anymore, but this was not one of those times. So, we decided to try again after the main event. My brother offered to be my co-conspirator in setting off the fireworks in a park close by my house. Nothing like a sibling to bring you right back to feeling like your slightly naughty and rebellious youthful self. I tried both of the barbecue lighters that I could find in the kitchen, and one of them seemed to work, so we stealthily walked over to the basketball court to line them up. This is not how we do it. I then tried to light the first one. My brother, being much more risk averse than me, was bravely standing at least 30 metres away – a mere half of the recommended distance on the side of the ‘Red Burst Volcano’. 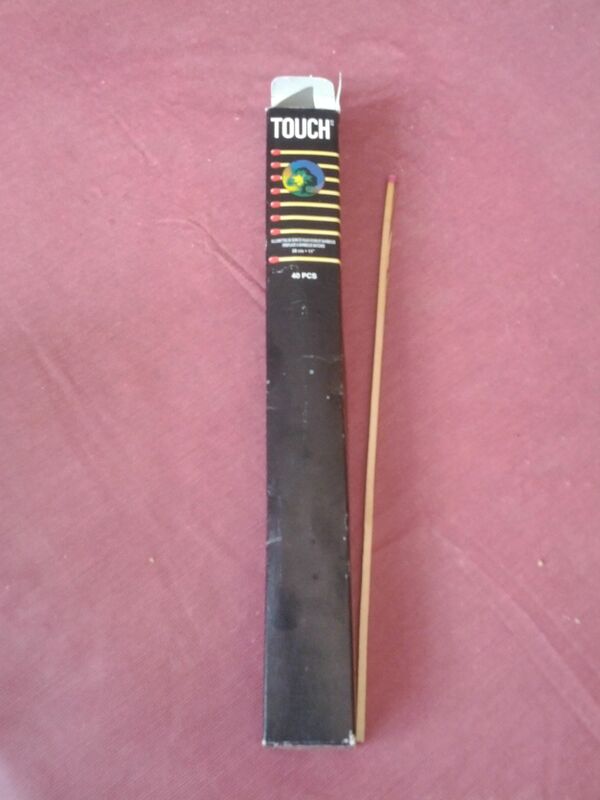 Of course, after about five minutes of trying, the barbecue lighter simply refused to spark a proper flame. Crap. So we skulked back to the house, where my hand triumphantly emerged from the junk drawer in the kitchen with a box of those really long matchsticks that I vaguely remember picking up in a dollar store many moons ago. We stealthily returned to the park. At this point, it was already past 11:30 pm and pretty well all of the lights in the nearby houses were long since extinguished. We resumed our positions, and I began to light the matches. One by one, they would burst into a dazzling flame, which would just as quickly be extinguished by a gust of wind before the fuse would catch on fire. I kid you not, I went through twenty-two of those suckers before my brother cautiously approached, raised his eyebrow, and reminded me that he had to be at work very early in the morning, and that perhaps we could try again tomorrow with, oh, I dunno, maybe a working lighter? Logic and reasoning often have no place once I set my mind to something; however, being the occasionally mature adult that I am, I respected his situation, and agreed that this was probably not going to happen. I won’t lie when I say that we were both likely a little relieved on some level as we walked back to the house with our heads held just that wee bit higher, with our long-lost childhood guilt somewhat assuaged. 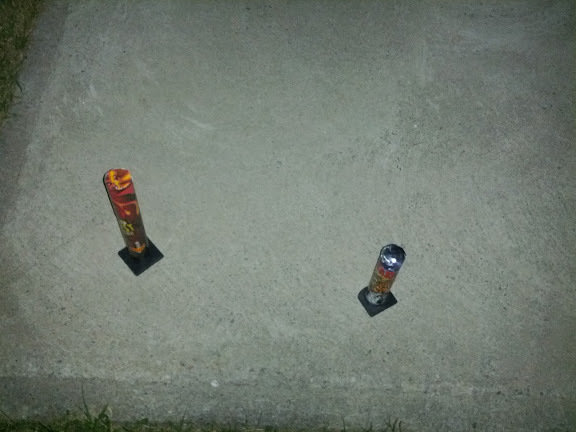 I put the fireworks away where they were unlikely to accidentally catch on fire, to be set ablaze on another day in the hopefully not too distant future. This entry was posted in Fun and Crazy and tagged Crazy, deal, fireworks, Fun, May, Toronto, Victoria day holiday, voucher. Bookmark the permalink.